I met up with another long-time friend for dinner while I was in Toronto last week. Since she lives and works in the city (as opposed to the suburbs where I had been frequenting all week), I was glad to have a chance to venture downtown a bit. After all, there is amazing food to be had in the city! Friend said she wanted to eat light (this was soon after Christmas, after all), so I consulted my restaurant wishlist and came up with a few options, from which she chose Beast. I first heard about Beast, oddly enough, from fellow Pittsburgh-area food blogger Rodzilla, who somehow found out about this place despite being a five-hour drive away. I took that as a good sign. Beast is definitely intriguing. Located in a row house on a small side street in King West, Beast is a bit of a study in contrasts. The wooden tables, the French doors, the curtains, and the cute patio portray it as a classy joint, but the graffiti-esque logo, the paintings adorning the walls depicting half animal-half humans, and indeed, the name of the restaurant, seem to reveal a mysterious, darker, wilder side. Beast's owner-chef makes everything in-house and sources from local, sustainable farms, something I really dig about a restaurant. 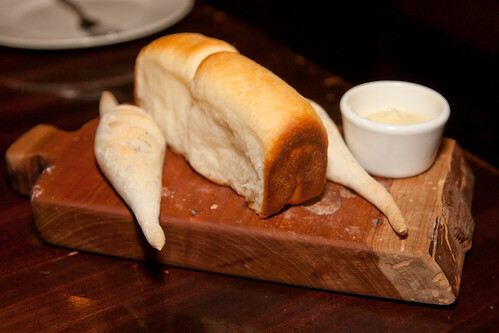 As such, the menu changes weekly to reflect currently available ingredients. The menu options are creative and interesting, another thing I really dig about a restaurant. Then came the four dishes we choose. 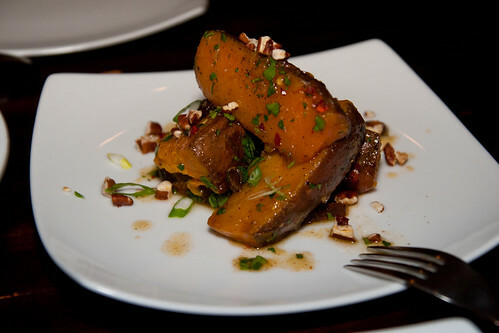 The Sweet Potato Wedges, Pecans, Maple Vinaigrette, Sultana Raisins were sweet, flavorful, and the chopped pecans provided a nice contrast in texture. 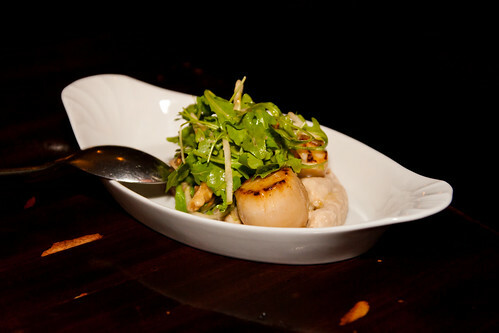 The Sea Scallops, Foie Gras, Celery Root Skordalia, Arugula was as good as the name implies. A tasty combination that works well together. Knowing that I'm a fan of poutine, Friend suggested that we get Beast's version of the "Poutine" (quotation marks original) which is of course not a real poutine. 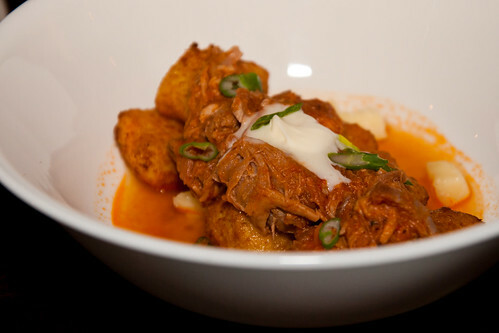 Instead of fries, this "poutine" has fried gnocchi which were crispy on the outside and soft on the inside, topped with delicious braised pork shoulder, cheese curds, and creme fraiche. And I saved my favorite for last: Smoked Rainbow Trout, Farro, Jerusalem Artichoke, Chestnuts. 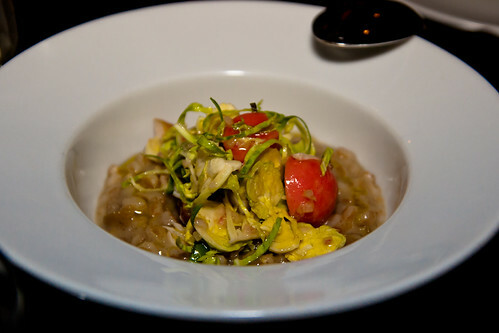 The smoked rainbow trout was the star here, emanating its perfectly smoked flavor through the farro. Simply delightful. Despite some complaints I've read that Beast's servings are small, I would actually disagree. As tapas, each of the four dishes was larger than I expected. Even though Friend and I only averaged two items each, we were more full than we wanted to be. Here, I was saying as we were making our decisions earlier that I wanted to save room for dessert! So much for that. 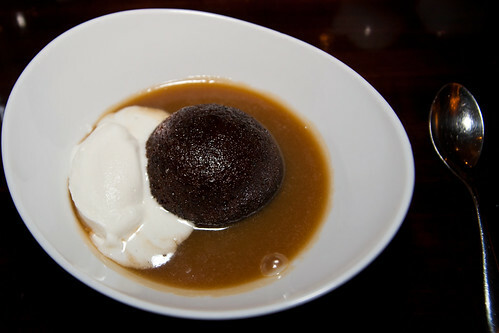 Of course I couldn't resist the Sticky Toffee Pudding. It was a bit sweeter than I had expected, but satisfying. Overall, I liked Beast quite a bit. Interesting, delicious dishes with ingredients that work well together, and the service was top-notch as well. Thanks for an awesome find, Rodzilla!